John Wells’s phonetic blog: Hallelujah! I pronounce it the singing way in speech sometimes. I had the chance to sing this beautiful piece with my choir last May. Being Spanish our mother tongue, we tend to forget the sound of the (h) and just say "aleluia". @ Sil: That doesn't sound too bad when you're singing though. It's almost like anything goes. Well, not exactly, but you can certainly get away with pronouncing things differently when you're singing. When I read the above post I had main stress in the normal place for Hallelujah, and only secondary stress on Chorus. I think that's probably typical for my pronunciation of that piece. Interesting. That same shift happens in Danish for some hymns. Oh. I've always pronounced it /ˌhæl.ə.ˈluːl.jə/. How comes? I've been wondering for some time. I don't know. The King James Bible and Wycliffe translations both have "Alleluia" in Revelation 19:1. The earliest citations for "Halleluiah" or "Hallelujah" I could find on Google Books are all in Latin works from the early sixteenth century. (Of course, "i" and "j" were not yet differentiated consistently at this time). My guess would be that people with some knowledge of Hebrew were more likely to write in Latin than in English, and thus used "i"/"j" to represent the palatal approximant. The question then becomes why this letter was not pronounced as an affricate in English (as it was in "Jesus", "Jerusalem", etc.) Perhaps because it came directly from Latin rather than via French? Your people with some knowledge of Hebrew who were more likely to write in Latin than in English, and thus used "i"/"j" to represent the palatal approximant, may instead have been using it to represent the iota with diaeresis in the Greek spelling to show that however unetymologically, it was not the palatal approximant. As JW says, and the OED confirms, the form alleluia comes to us via Greek rather than direct from Hebrew. The OED gives the Greek spelling with the diaeresis, and this is presumably why they only give the pronunciation ælɪˈl(j)uːɪə for it, and e.g. Sir John Tavener still scores it with that extra syllable. That would answer the question why this letter avoided being pronounced as an affricate in English (as it was in "Jesus", "Jerusalem", etc.) And the weird pronunciation of Robert Gibson and your grandmother with an intrusive /l/ may have originated in stuttered attempts to fit in the weird lj option indicated by the l(j) in the OED. But lo and behold, for hallelujah the OED agrees with the dictionaries that "tell us that the interjection/exclamation hallelujah is pronounced ˌhælɪˈluːjə (or -lə-)", with no weird alternative pronunciations. There has long been a miscellany of spellings of course, but between them they seem to have warded off the change to dʒ. In American English, there's another word where "the spelling corresponds to the pronunciation j (palatal semivowel)," namely jaeger. Outside North America, I believe these birds are called "the three smaller skuas". Yes, of course the actual question isn't why /y/ is represented by j but why it isn't /dʒ/ anyway, whatever the spelling. Even the name Jah itself, spelled in various ways in older bible translations, is pronounced thus. My best guess is it's the influence of ex-Greek alleluia. I'm not sure the intervocalic position has anything to do with it. My best guess is it's the influence of ex-Greek alleluia. The OED gives the Greek spelling with the diaeresis, and this is presumably why they only give the pronunciation ælɪˈl(j)uːɪə for it, and e.g. Sir John Tavener still scores it with that extra syllable. Presumably this is syllabified ælɪˈl(j)uː.ɪ.ə, meaning that "alleluia" has two consecutive hiatuses -- are there any other words with this remarkable property? I have been thinking about this quite a bit, and I don't think your thesis can be quite correct. All the Western church music I know that sets the word "Alleluia" has it as four syllables. There's an example of Gregorian chant here. Orthodox music, on the other hand, tends to set it as five syllables, for example in Rachmaninoff's All-Night Vigil here. And Tavener, being Orthodox himself, doubtless followed Orthodox usage on this point. * In the Orthodox church, "Alleluia" has always been five syllables. * In the Latin/Western church, "Alleluia" has always been four syllables. * When the word "Hallelujah" became known in England (and probably elsewhere in Western Europe) it was conformed in pronunciation with the pre-existing "Alleluia", except for the possible addition of the inital /h/. I have always regarded* Alleluia as the Catholic spelling and Hallelujah as a Protestant variant. In which case the corresponding pronunciation would serve in Ireland as a reverse shibboleth of the name of the letter H.
You are clearly still talking about the form 'alleluia' and its relationship with the other forms in h-. And we probably still agree that it's for etymological reasons that the OED has two separate entries, one for this 'alleluia', giving the unique pronunciation ælɪˈl(j)uːɪə for it, still traceable to the Septuagint, and with no alternative spellings except in the citations, and one for the the forms in h- under 'hallelujah, -iah', giving the unique pronunciation ˌhælɪˈluːjə for it, and the alternative spellings in h-: halleluiah, halleluya, halleluia, halaluiah. 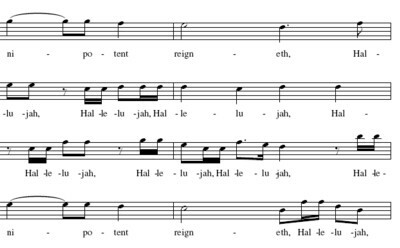 When the word "Hallelujah" became known in England (and probably elsewhere in Western Europe) it was conformed in pronunciation with the pre-existing "Alleluia", except for the possible addition of the inital /h/. I wouldn't put it quite like that. I think the h and the j were only ever an etymologizing afterthought inspired by the biblibal scholarship invested in the new translations. I still think the persistence of the i and y spellings is evidence of continuing awareness of the Greek spelling, but it looks as if in addition the pronunciation with [j] or [i] was too well established to be influenced by the etymologizing -j-, even though the equally etymologizing h- seems to have caught on. All this is apparent from the alternative spellings that do occur in the OED citations for 'alleluia': alleluia, aleluya (1382 and 1398) and alleluiah, and the ones for 'hallelujah. -iah', which are its first appearances from the Coverdale bible: halleluya (1535) and halleluiah (1557), and a few mercurialia, with 'hallelujah' coming in from 1625. I'm delighted to discover that the author of this blog is also, like myself, a choral singer. As a phonetician as well, you must appreciate the unique(?) feature of the pre-IPA phonetic transcription used by the OED, of indicating in a most economical way both the normal speech pronunciation of certain unstressed vowels, and the 'ideal' values that such vowels could take in situations of very careful enunciation and, notably, in singing. Now, the OED1 transliteration of Hallelujah is (hælĭlū·yă). That indicates a speech pronunciation /hælɪˈluːjə/ and a singing pronunciation /hæli(ː)ˈluːja(ː)/. However, as you rightly note, most singers give the second syllable a pseudo-Continental /eɪ/ sound; and, in my experience, the first syllable generally becomes /hɑː/, /ha/, or /hʌ/. I must admit that I often pay an inaudible homage to Sir James Murray by singing the vowels he recommended, safe in the knowledge that my /hæ/ and /liː/ will be drowned out by the hundred or so other singers around me! I sing in a choir too. I know about those Continental values. Last year we were told to sing 'Jesu' as /'jeɪzu:/ rather than /'ʤi:zju:/. @Peter: funny you should say that. There was a question about this only yesterday choralnet.org. In his teenage masterpiece "A Boy Was Born", Benjamin Britten explicitly specifies that "Jesu" be thus pronounced. Funny thing about hallelujah is how many people believe it to be a Hebrew word when in fact it's a Latin word. Hallelujah a Latin word? Where do you get that idea from?